Have you ever seen a child break something valuable and then try to hide the pieces, rather than confess to his parents? This is the same behavior that some people employ when they cause an accident – commonly called a hit and run (H&R). A hit and run is a crime, and it’s defined as being involved in a collision with another car, pedestrian, or property, and knowingly leaving the scene without stopping to give his or her name, license number, and other information to someone at the scene. If another driver rear-ends you at a stop sign and then drives away without stopping to exchange information, that’s H&R. If you emerge from a store to find that someone has side-swiped your car and left the scene, that’s also H&R. Remain at the scene for a reasonable amount of time (“reasonable” in AR is defined as no less than 30 minutes) to speak with police, unless you must leave to give aid to the injured person. The vast majority of the time, someone who commits H&R is the at-fault driver in the accident, but anyone driving a car involved in the accident who leaves the scene can be charged with hit and run. Their desire to avoid consequences may stem from a number of reasons. They may have been intoxicated, without insurance, driving a stolen or borrowed vehicle, driving without a license, engaged in illegal activities, or have outstanding warrants. While the penalties for leaving the scene of an accident vary from state to state, hit and run is a criminal offense. Penalties also depend on the severity of the damage, including property damage, and the severity of other passengers’ injuries. Arkansas law states that anyone who leaves the scene of an accident where a person has been injured or killed may be charged with a Class D felony, and their license will be revoked. Penalties are less severe for accidents where only property damage is involved, but those still include a fine and revocation of your drivers’ license. While police will attempt to find drivers who leave the accident scene, it’s difficult to do without much information to help them. If the accident occurred in a parking lot, where you never saw the other driver, it may not be possible to identify the driver. In those cases, Arkansas law presumes that a driver who leaves the accident scene is uninsured. It’s a good idea to have uninsured motorist coverage on your insurance policy because that will be used to cover H&R damage. You would never have time for a Google search immediately after an accident. That’s why it’s important to learn what details to look for immediately after an accident, long before you’re ever involved in one. Look for the car license number, make, and color of the other car. If the driver gets out of the car, try to take in as many details as you can. This information can help the police locate the driver. In many cases, of course, you may be injured or in shock immediately after the wreck. It all happens quickly, and it’s understandable that you may not remember many details. In that case, ask for witnesses at the accident scene. You can also return to the scene and ask nearby businesses if they might have video surveillance of the area. Witness statements and video footage can be powerful evidence in identifying a hit and run driver. To learn more, look at Arkansas Code Title 27, Chapter 53. Were you injured in a hit and run accident? 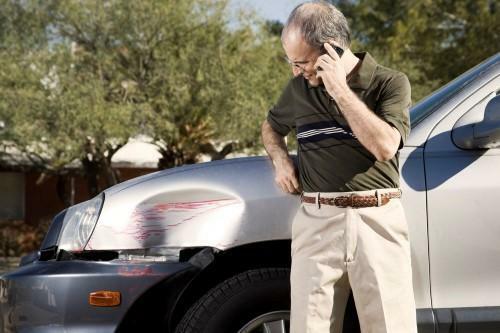 The injury lawyers at Taylor King Law have years of experience helping people just like you. You may have legal rights, but there is a statute of limitations in Arkansas, so you’ll want to call as soon as possible. Call 1-800-CAR-WRECK or submit an online form to begin your Free Consultation with Taylor King.